The Lunar and Planetary Institute (LPI) is hosting a special Exploration Science Summer Intern Program to build on the success of the former Lunar Exploration Summer Intern Program that was designed to evaluate possible landing sites on the Moon for robotic and human exploration missions. Over a five year period (2008–2012), teams of students worked with LPI science staff and their collaborators to produce A Global Lunar Landing Site Study to Provide the Scientific Context for Exploration of the Moon. The program for 2015 is designed to have the same impact on future exploration activities, but has a broader scope that includes both the Moon and near-Earth asteroids. It is a unique opportunity to integrate scientific input with exploration activities in a way that mission architects and spacecraft engineers can use. Activities may involve assessments and traverse plans for a particular destination (e.g., on the lunar farside) or a more general assessment of a class of possible exploration targets (e.g., small near-Earth asteroids). This program is open to graduate students in geology, planetary science, planetary astronomy, and related programs. It is also open to exceptional undergraduate students with at least 50 semester hours of credit in those fields. The 10-week program runs from May 26, 2015, through July 31, 2015. Selected interns will receive a $5600 stipend to cover the costs associated with being in Houston for the duration of the program. Additionally, U.S. citizens will receive up to $1000 in travel expense reimbursement and foreign nationals will receive up to $1500 in travel expense reimbursement. 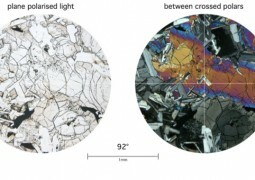 The virtual microscope allows users to examine and explore minerals and microscopic features of lunar rocks. The moon's deepest craters are 4,500 meters (15,000 ft).